Alf Field: Correction in Gold is OVER and on Way to $4,500+! In this case, the A and C waves are equal in percentage terms at 14.5% and 14.7%. The overall decline from $1895 to $1531 is -$364 or -19.2%. In my speech to the Sydney Gold Symposium last November, [which was edited into 2 articles, namely: Alf Field: Gold Going to $4,500/ozt. in Next Wave Towards Parabolic Peak and Alf Field is Back! 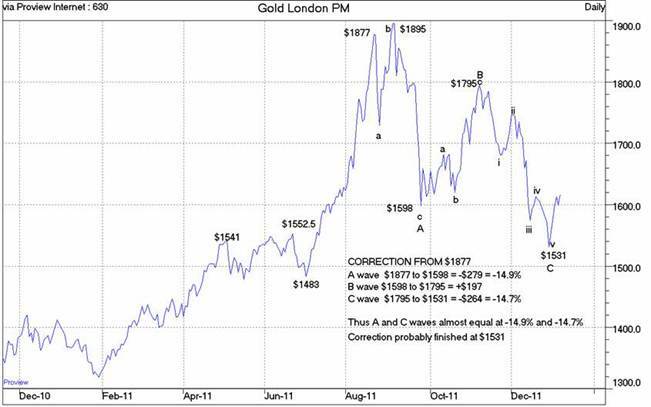 The “Moses” Generation and the Future of Gold] showed that the largest corrections in the previous Intermediate wave from $700 to $1895 were about 12% in PM fixings. The forecast was that the current correction from $1895 would be one degree of magnitude larger than 12%. A decline of 19.2% qualifies as one degree larger than 12%. 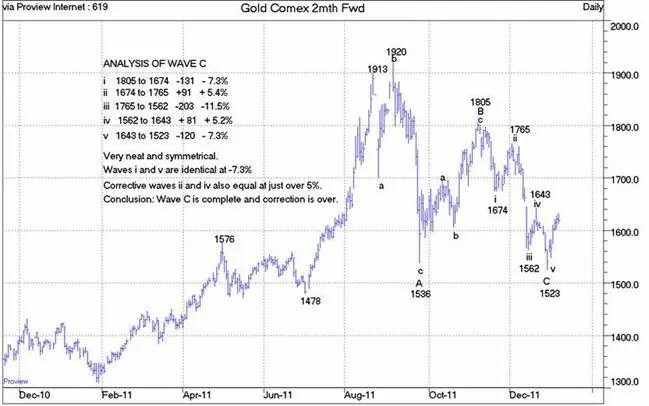 The C wave of the correction in the chart above reveals some symmetrical subdivisions which confirm that the C wave was completed at $1523 on 29 December 2012. With all the minor waves in place and with the correction being of the correct size, that should be the end of both the correction and Intermediate Wave II. The probability of this analysis being correct is high, perhaps 75%. Smaller probabilities allow for: (i) this to be an A wave of a larger magnitude correction; (ii) the current correction becoming more complex, perhaps reaching the lower price targets (e.g. -26%); and (iii) the possibility of deflation, defaults and depression emerging, also testing lower price targets. The up move just starting in gold should be Intermediate Wave III of Major Wave THREE, the longest and strongest portion of the bull market. The gain in Intermediate Wave I from $680 to $1913 was 181%. The gain in Intermediate Wave III should be larger, at least a 200% gain. A gain of this magnitude starting from $1523 targets a price over $4,500. The largest corrections on the way to this target, of which there should be two, should be in the 12% to 14% range. 3. Alf Field: Will Derivative Losses Be Black Swan Event Propelling Gold to $4,500? 8. 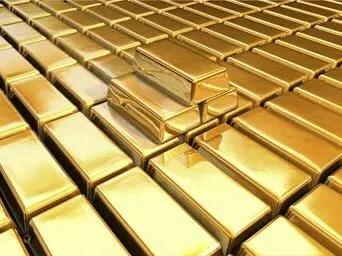 What Do Gold Measurements “Troy” Ounce and “Karat” Really Mean? Previous Leeb: Gold Going to $3,000 Before the End of 2012!